Swedish death metal tyrants DEMONICAL teamed up with their countrymen LIK (Stockholm-based death metal) for a tour of Europe including Poland, Germany and Czech Republic this November. The band will hit the road in support of their fifth studio album Chaos Manifesto, released in March on Agonia Records. 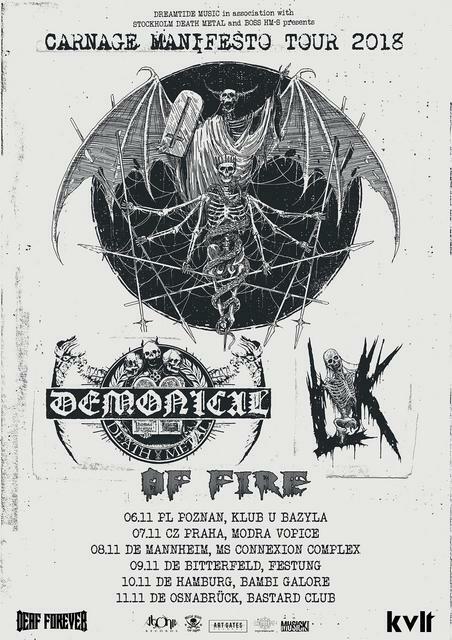 The opening act will be Of Fire, a death 'n' roll performer also from Sweden. DEMONICAL arose from the ashes of formerly disbanded CENTINEX in 2006, and in comparison to its older sibling, executes death metal in a far more impetuous and melodic manner. Chaos Manifesto is a testament to that statement. After nearly five years since the release of the last full-length album Darkness Unbound (2013), the Swede's - now led by a new prominent death growler Alexander Högbom (OCTOBER TIDE, CENTINEX) - continue the traditional DEMONICAL path with fierce HM-2 driven death metal of utter brutality, yet return in a partially new, yet fully fit five-piece line-up. Chaos Manifesto was mixed and mastered by Karl Daniel Lidén (TERRA TENEBROSA, CULT OF LUNA, Katatonia).